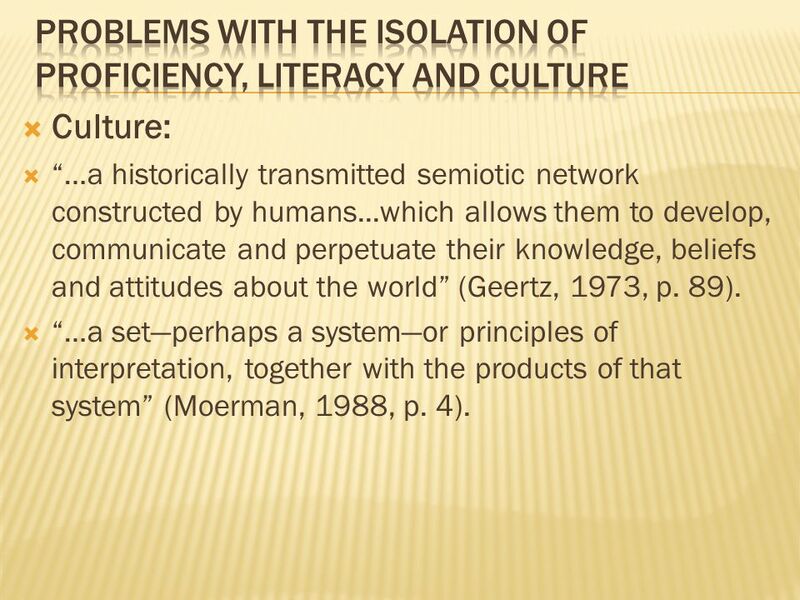 4  Culture:  “…a historically transmitted semiotic network constructed by humans...which allows them to develop, communicate and perpetuate their knowledge, beliefs and attitudes about the world” (Geertz, 1973, p. 89).  “…a set—perhaps a system—or principles of interpretation, together with the products of that system” (Moerman, 1988, p. 4). 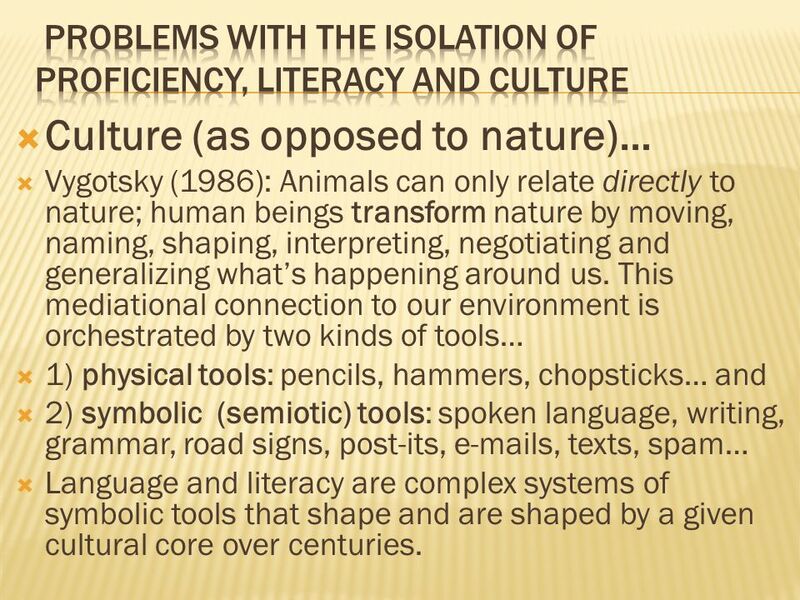 5  Culture (as opposed to nature)…  Vygotsky (1986): Animals can only relate directly to nature; human beings transform nature by moving, naming, shaping, interpreting, negotiating and generalizing what’s happening around us. 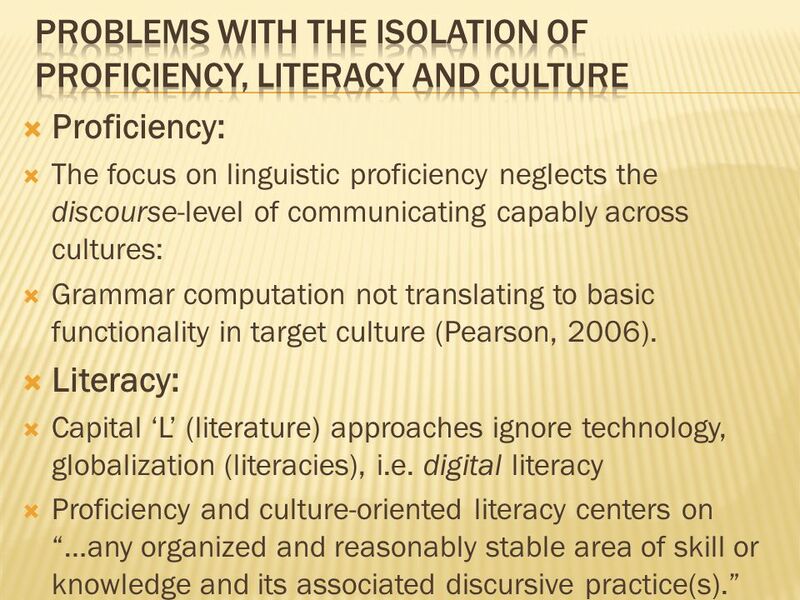 This mediational connection to our environment is orchestrated by two kinds of tools…  1) physical tools: pencils, hammers, chopsticks… and  2) symbolic (semiotic) tools: spoken language, writing, grammar, road signs, post-its, e-mails, texts, spam…  Language and literacy are complex systems of symbolic tools that shape and are shaped by a given cultural core over centuries. 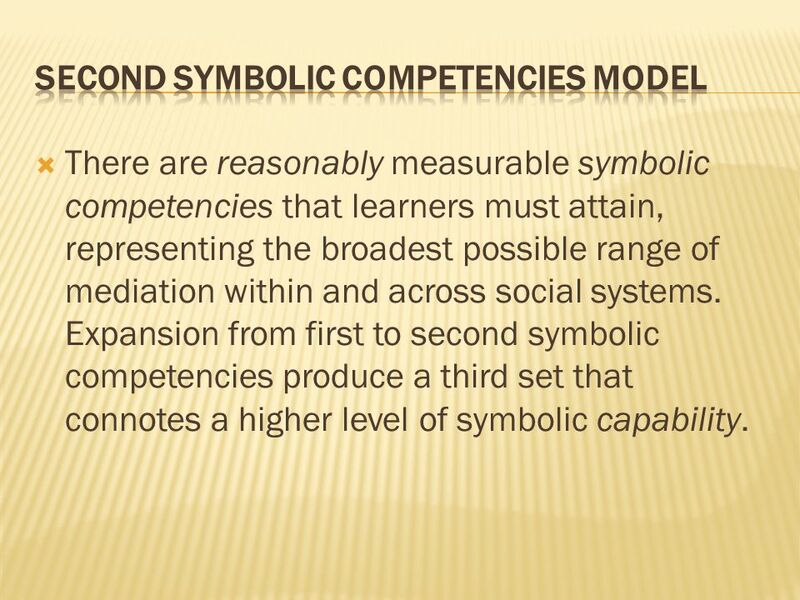 8  There are reasonably measurable symbolic competencies that learners must attain, representing the broadest possible range of mediation within and across social systems. 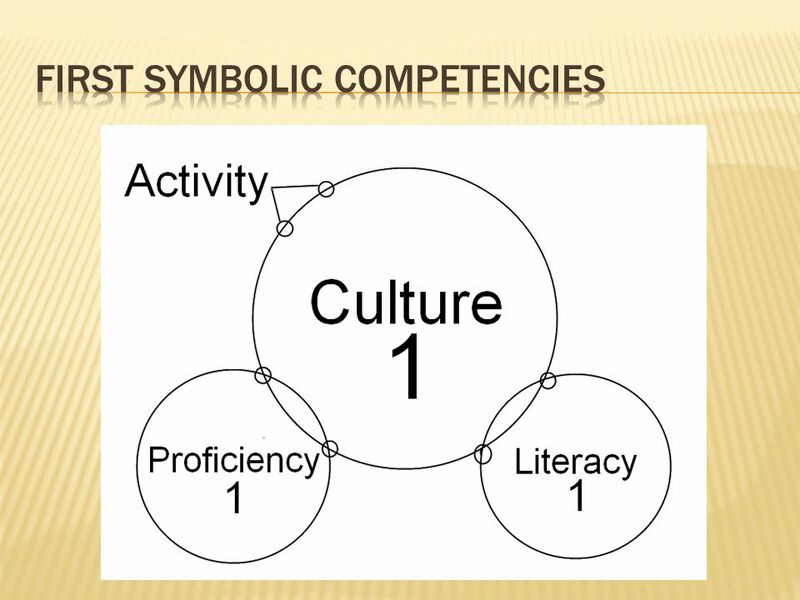 Expansion from first to second symbolic competencies produce a third set that connotes a higher level of symbolic capability. 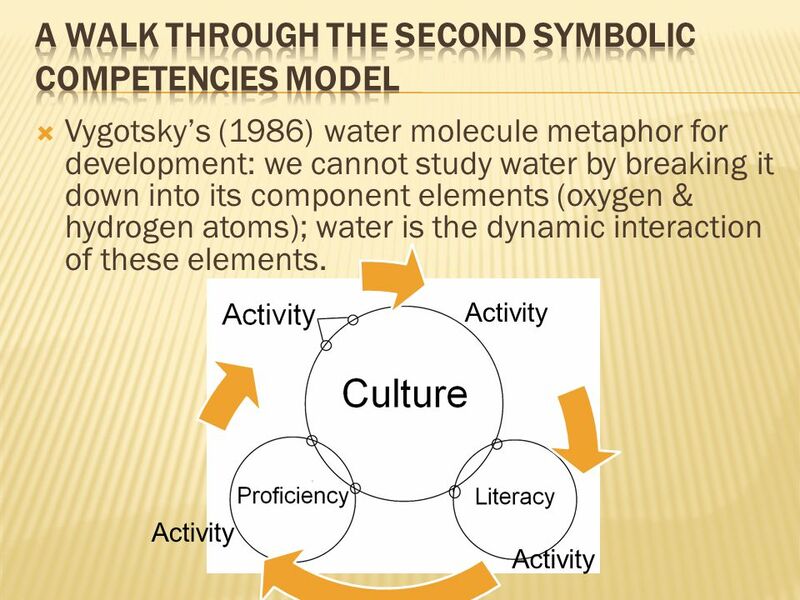 12 Activity  Vygotsky’s (1986) water molecule metaphor for development: we cannot study water by breaking it down into its component elements (oxygen & hydrogen atoms); water is the dynamic interaction of these elements. 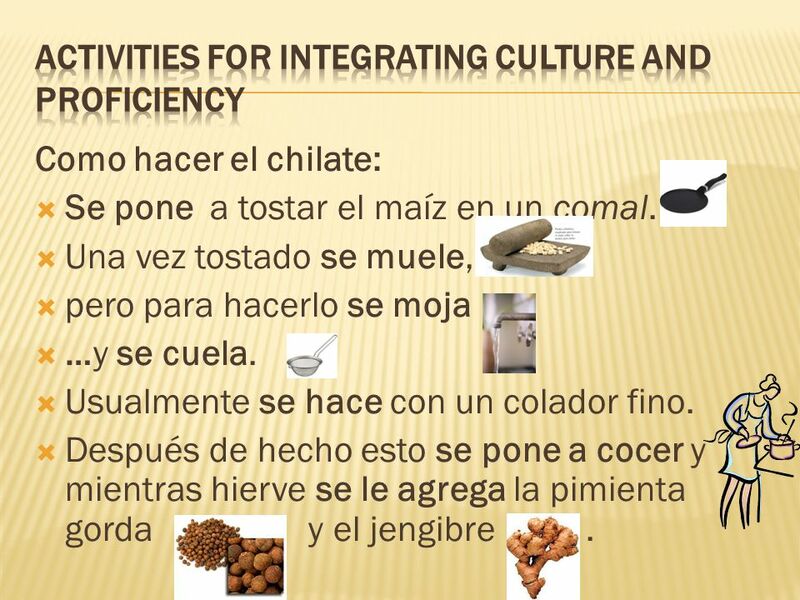 14 Como hacer el chilate:  Se pone a tostar el maíz en un comal.  Una vez tostado se muele,  pero para hacerlo se moja  …y se cuela.  Usualmente se hace con un colador fino.  Después de hecho esto se pone a cocer y mientras hierve se le agrega la pimienta gorda y el jengibre. 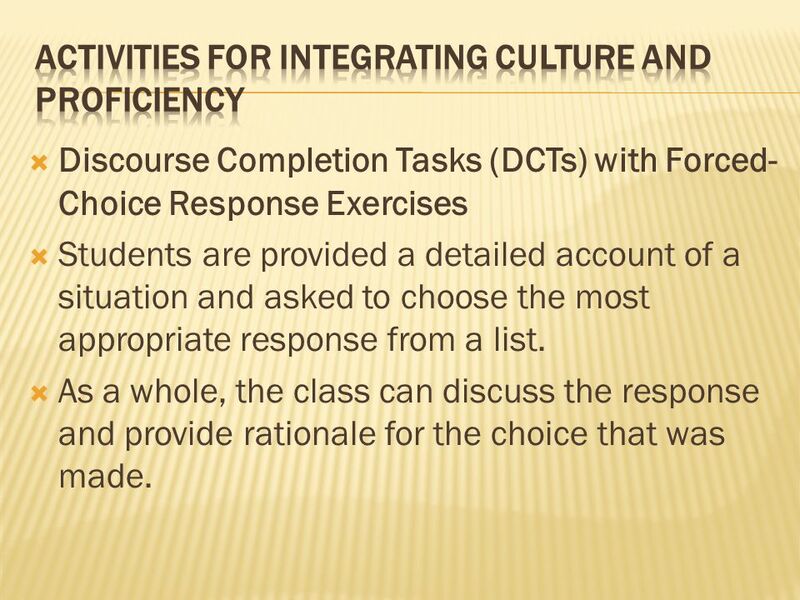 16  Discourse Completion Tasks (DCTs) with Forced- Choice Response Exercises  Students are provided a detailed account of a situation and asked to choose the most appropriate response from a list.  As a whole, the class can discuss the response and provide rationale for the choice that was made. 17 ContextPossible ResponsesExplanation Vous êtes dans la bibliothèque à votre école. Vous essayez de lire un livre, mais un autre étudiant, que vous ne connaissez, parle à haute voix, avec sa copine. Alors, vous vous sentez obligé de lui dire de se taire. Vous dites : [ ] Rien [ ] Taisez-vous s’il vous plait. [ ] Un peu de silence, maintenant. [ ] Fermez-la ! [ ] S’il vous plait. Je ne peux pas me concentrer. Alors, s’il vous plait, parlez moins fort. Vous êtes chez votre patron. Il vous sert de la viande, mais vous êtes végétarien. Vous dites: [ ] Rien [ ] Excusez-moi, mais je ne mange jamais de viande. C’est horrible ! [ ] C’est dégoutant de manger de pauvres animaux. [ ] J’ai mal au ventre. Il faut que je rentre chez moi. [ ] Cela a l’aire somptueux, mais je suis végétarien. Alors, je prends des légumes et un peu de salade. 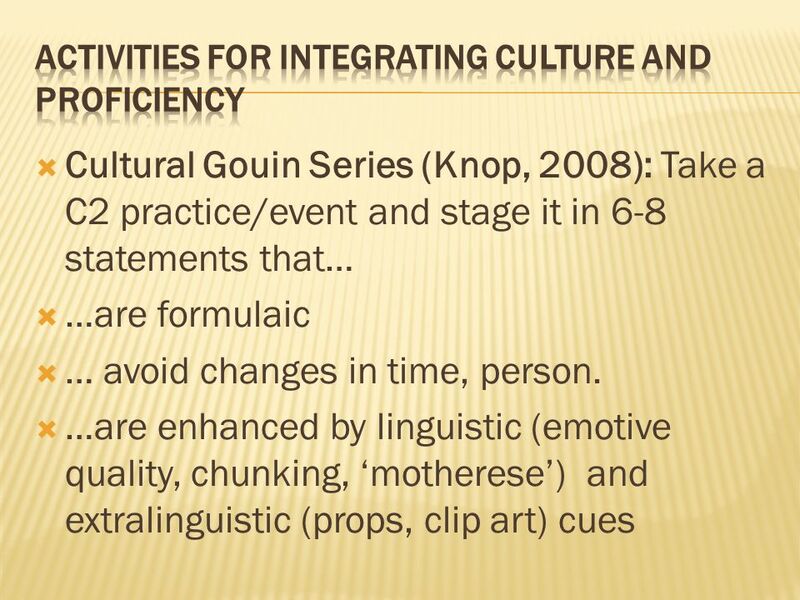 18  Purpose of SMLP: Engages active, full, critical interaction with text, with a focus on symbolic capability across cultural contexts (NYS iteration of Core has added dozens of related indicators). 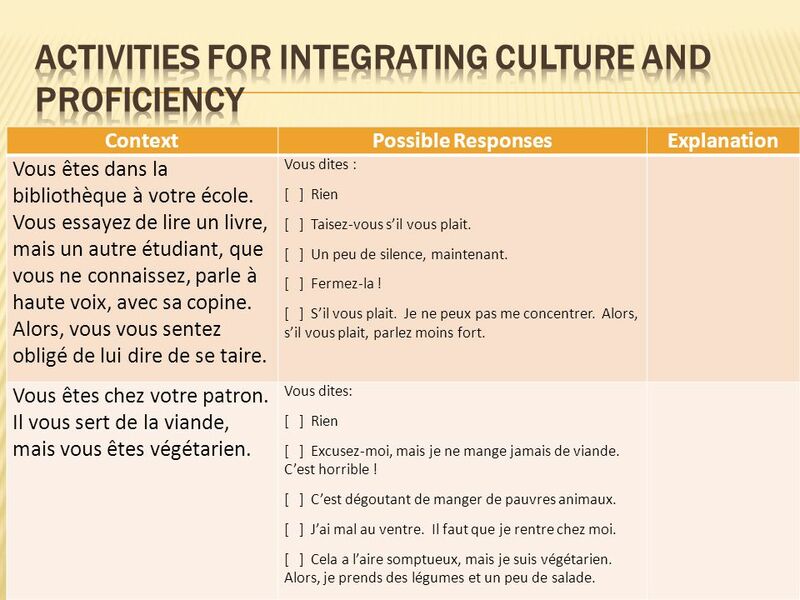  Bilingual Common Core Initiative: Follows path from receptive (listening & reading) to productive (speaking & writing) tasks. 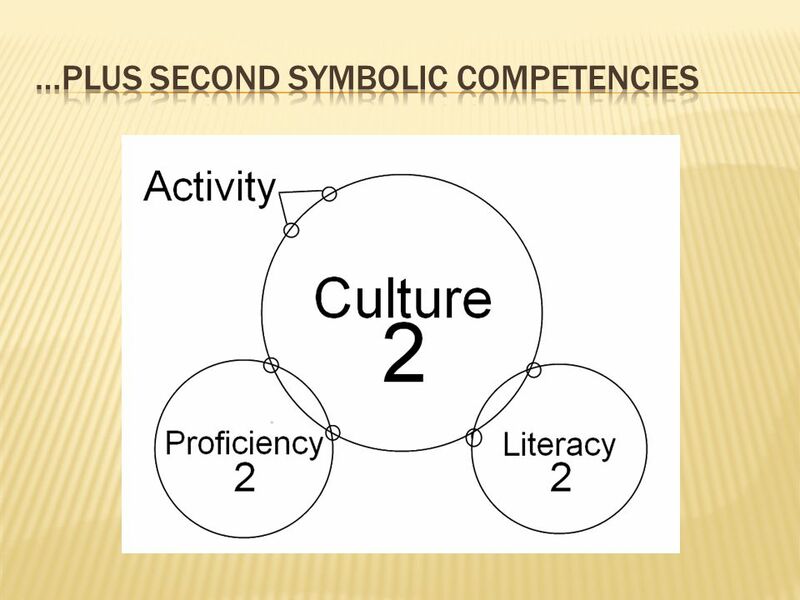  Targets global competence, 21 st Century Learning Skills.  Easily adapted to integrate a range of learning objectives across the strands. 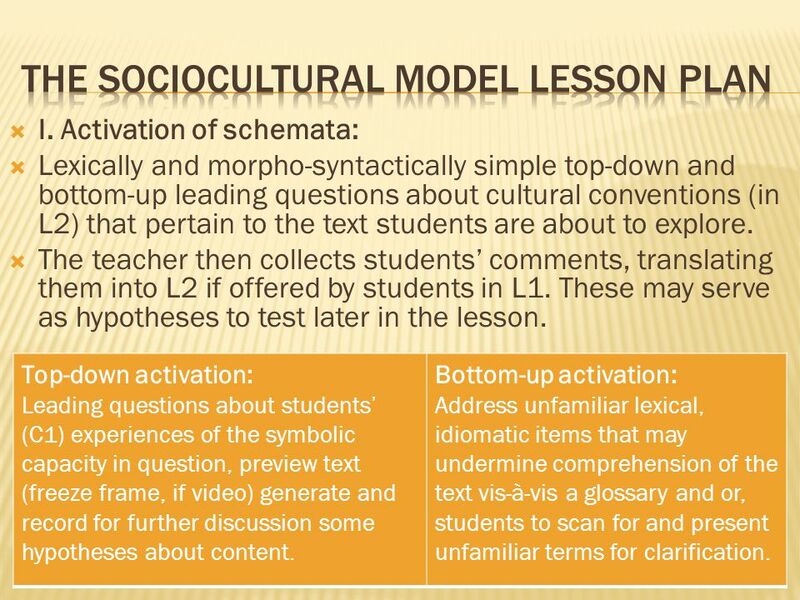 20  I. Activation of schemata:  Lexically and morpho-syntactically simple top-down and bottom-up leading questions about cultural conventions (in L2) that pertain to the text students are about to explore.  The teacher then collects students’ comments, translating them into L2 if offered by students in L1. These may serve as hypotheses to test later in the lesson. 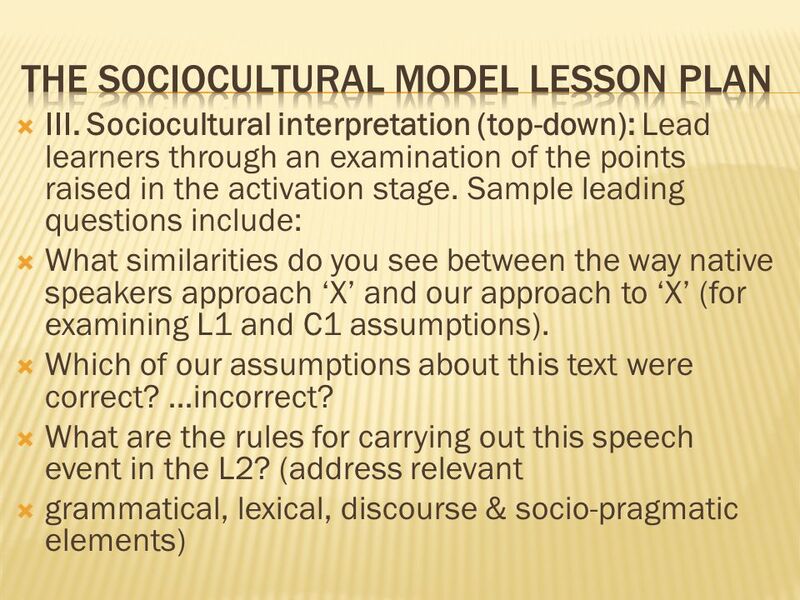 Top-down activation: Leading questions about students’ (C1) experiences of the symbolic capacity in question, preview text (freeze frame, if video) generate and record for further discussion some hypotheses about content. 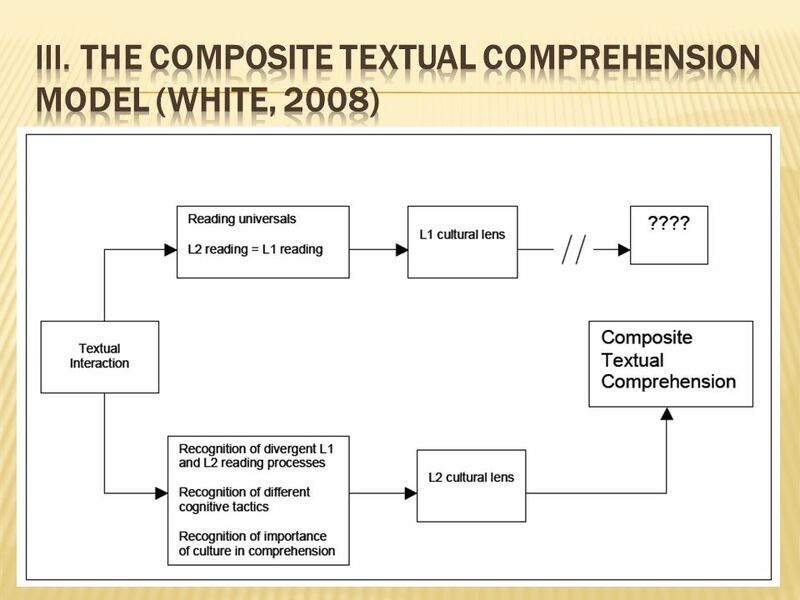 Bottom-up activation: Address unfamiliar lexical, idiomatic items that may undermine comprehension of the text vis-à-vis a glossary and or, students to scan for and present unfamiliar terms for clarification. 21  II. 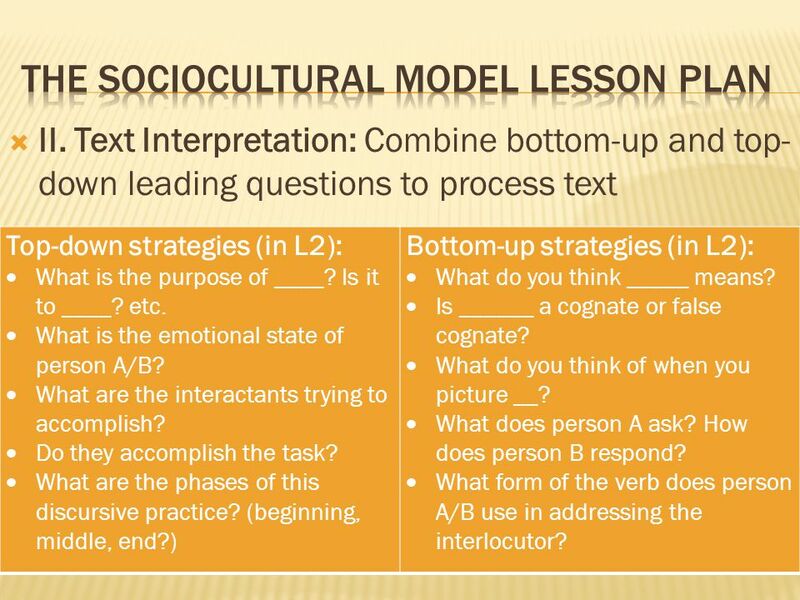 Text Interpretation: Combine bottom-up and top- down leading questions to process text Top-down strategies (in L2):  What is the purpose of ____? Is it to ____? etc.  What is the emotional state of person A/B?  What are the interactants trying to accomplish?  Do they accomplish the task?  What are the phases of this discursive practice? (beginning, middle, end?) Bottom-up strategies (in L2):  What do you think _____ means?  Is ______ a cognate or false cognate?  What do you think of when you picture __?  What does person A ask? How does person B respond?  What form of the verb does person A/B use in addressing the interlocutor? 23  IV. 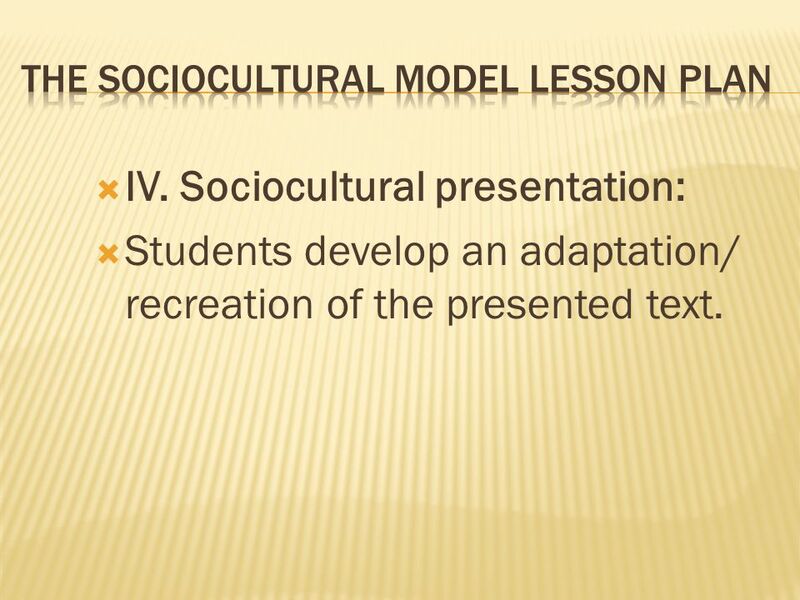 Sociocultural presentation:  Students develop an adaptation/ recreation of the presented text. 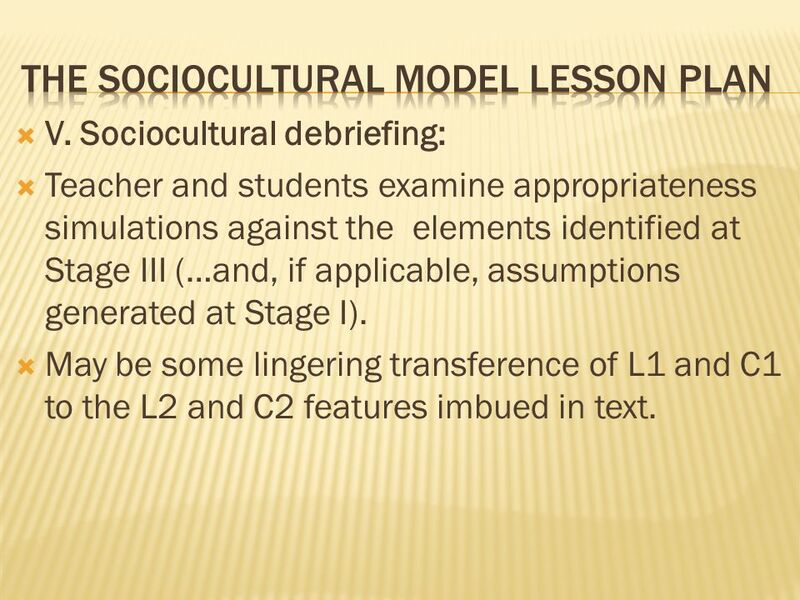 24  V. Sociocultural debriefing:  Teacher and students examine appropriateness simulations against the elements identified at Stage III (…and, if applicable, assumptions generated at Stage I).  May be some lingering transference of L1 and C1 to the L2 and C2 features imbued in text. 25  Questions? 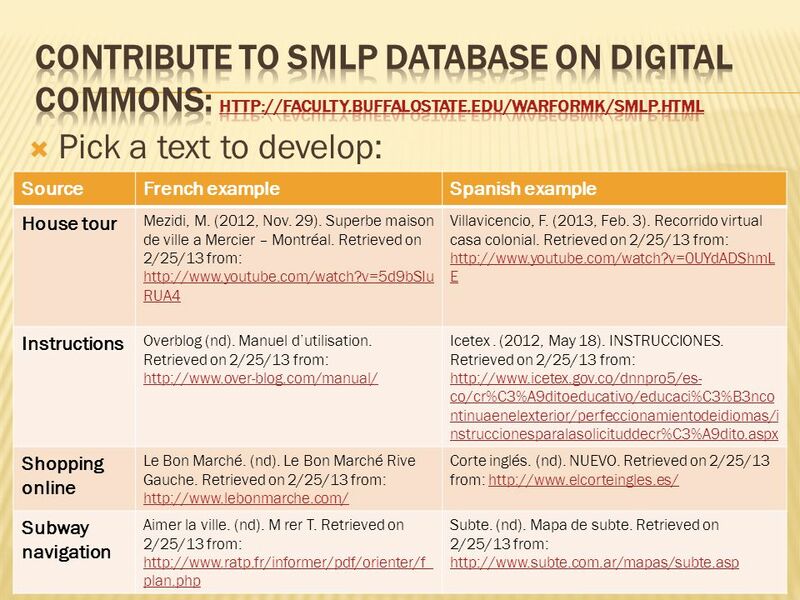  Submissions to SMLP Database highly encouraged (especially French! 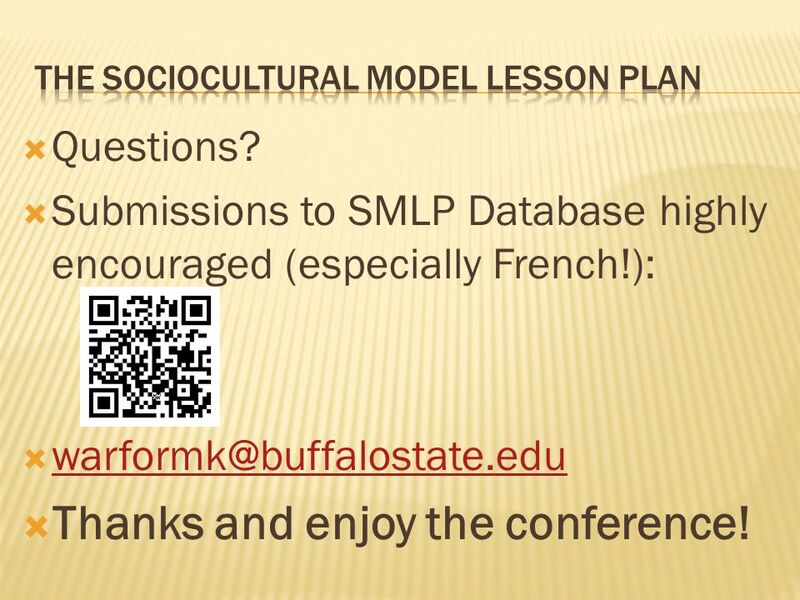 ):  warformk@buffalostate.edu warformk@buffalostate.edu  Thanks and enjoy the conference! 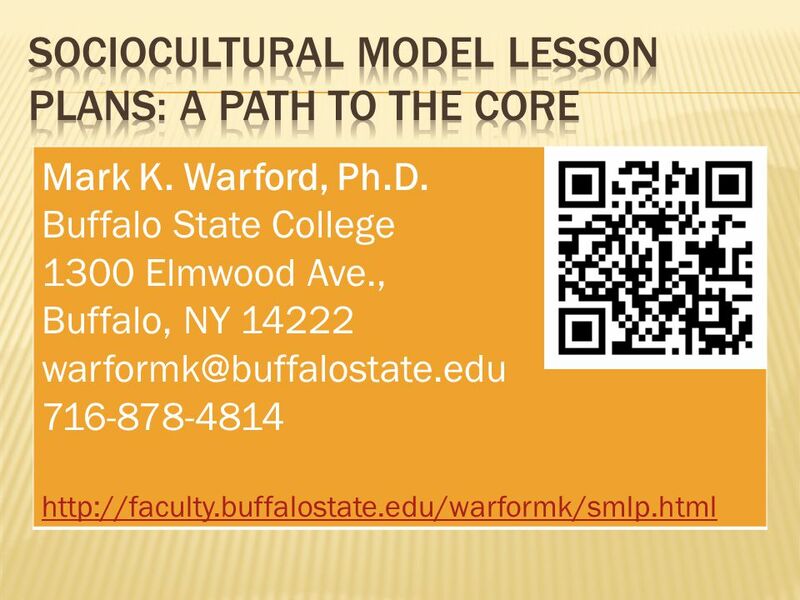 Download ppt "Mark K. Warford, Ph.D. Buffalo State College 1300 Elmwood Ave., Buffalo, NY 14222 716-878-4814"
Mark K. Warford, Ph.D. Buffalo State College 1300 Elmwood Ave., Buffalo, NY William L. White, Ed.D. Buffalo. Transforming lives through learningDocument title. Second Language Acquisition and Real World Applications Alessandro Benati (Director of CAROLE, University of Greenwich, UK) Making. Session 2 The Planning Process for Literacy. 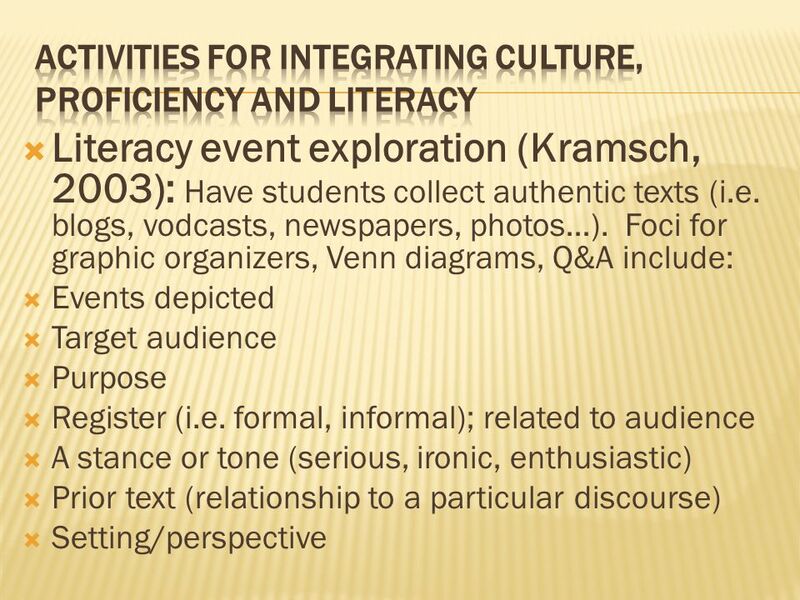 Aims of the session: To consider how to develop the phases of the planning process for a literacy unit of. ICT Scope and Sequence Sekolah Ciputra 2010. The LOTE and Linking Communication domains. Language learning is all about communication. 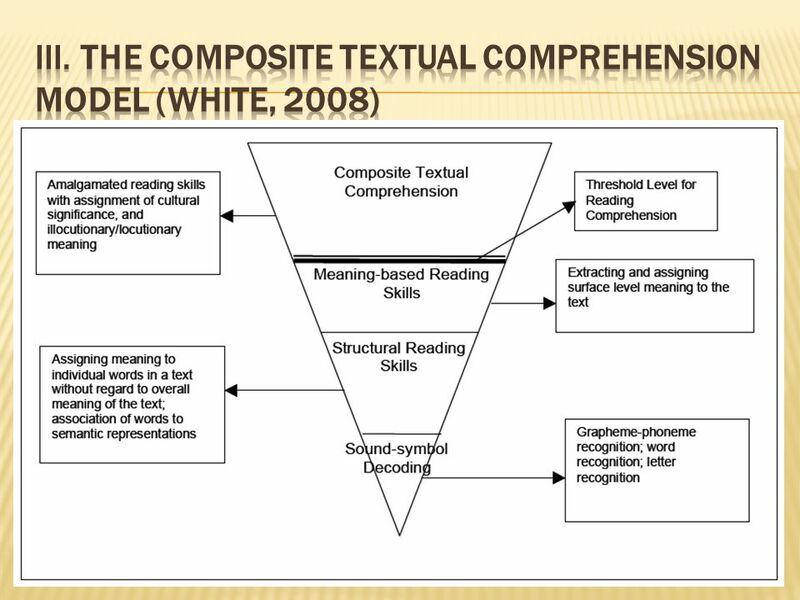 Learners listen to, read and view language in varying text types. 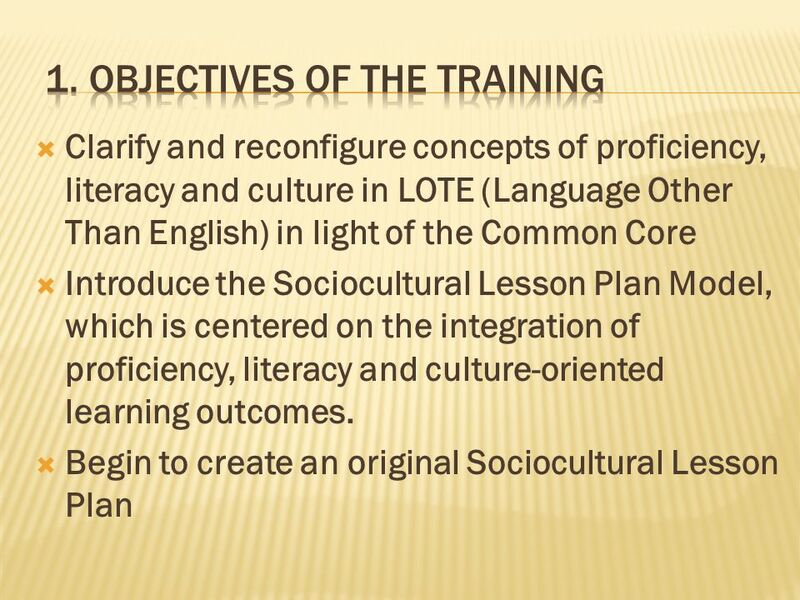 The 6 Principles of Second language learning (DEECD,2000) Beliefs and Understandings Assessment Principle Responsibility Principle Immersion Principle.